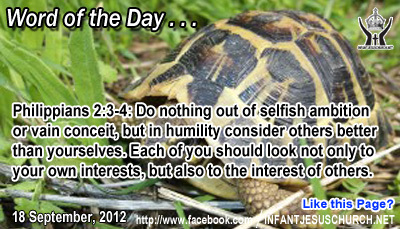 Philippians 2:3-4: Do nothing out of selfish ambition or vain conceit, but in humility consider others better than yourselves. Each of you should look not only to your own interests, but also to the interest of others. Heavenly Father, teach us to love our family as you do. We get so caught up and distracted with our own world and our own problems that we forget to notice those who are hurting around us. Help us to grow more aware and more adjusted to their needs so you may minister to them through us. In the name of Infant Jesus we pray. Amen. In today’s gospel passage make clear that God takes no pleasure in the death of anyone; he needs life, not death. Jesus not only had heart-felt sympathy for the widow who lost her only son, he also had unusual supernatural power – the capability to restore life and to make entire again. Jesus, however, as a watchful Jew incurred grave risk by approaching the bier, since the Jews unwritten that contact with a dead body made oneself ritually polluted. His physical touch, however, not only returned life but brought freedom and completeness to soul as well as body. This miracle took place near the spot where the prophet Elisha lift up another mother's son back to life again. Jesus asserted as his own one whom death had seized as its victim. By his word of power he brought back life for a young man marked for death. Jesus is Lord not merely the living other than the dead as well. Jesus’ victory over the grave and he promises that since he lives, we also shall have plentiful life with and in him both now and everlastingly. Do we trust in the Lord Jesus to give you abundant life and everlasting hope in the face of life's trials, bad luck and moments of despair?